Spanning 60-some years, Arif Anwar's debut novel explores aspects of Bangladesh's history and how matters of race, religion, and nationality have shaped personal lives. Regardless of where on the spectrum a work of historical fiction may lie, one thing it must do is give us the personal, interior lives of those affected by the events in question. We can go to history texts if we simply want the facts (though, yes, their interpretation varies from historian to historian and "evidence" is a rather wide-ranging term for how those facts are supported). If we want to know how people in that time lived and thought and felt, if we want to seek out the individual, personal stories from the larger communal stories, we turn to fiction. The tropes of fiction help us to not only fill the gaps in those personal stories but also to revisit those communal ones from different, fresh points of view. 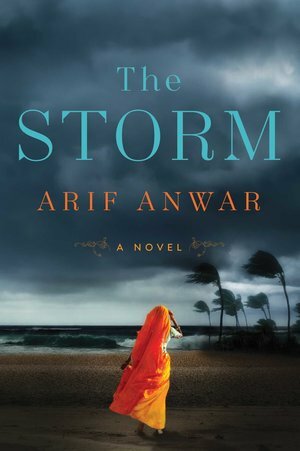 With his recent debut novel, The Storm, Arif Anwar aims to do the above with wide-reaching scope. The narrative stretches from the 1940s to the 2000s and from the South Asian subcontinent to the US. The characters are of British, Japanese, Burmese, Indian, Bangladeshi, and American descent. The main historical events included are the 1942 Japanese occupation of the British colony, Burma (as Myanmar was known then), the 1946 pre-Independence Hindu-Muslim communal violence in Calcutta (as Kolkata, the capital of West Bengal, was known till 2001), and the 1970 Bhola cyclone that killed 500,000 in East Bengal (as Bangladesh was first known after the 1947 India-Pakistan partition). This is a vast physical and figurative landscape with much conflict and destruction due to race, religion, and nationality. The aftermath of these seismic events is causing reverberations in the regions even today. Shahryar (Shar) Choudhury, the protagonist, has survived the 1970 cyclone as a three-year-old child and is now a grown man in post-9/11 America. He's desperately trying to find a way to stay on despite visa problems for the sake of his nine-year-old daughter, Anna, who lives with his ex-girlfriend and her partner. In the meantime, Shar's past has already begun to unravel back in Bangladesh and keeps pulling him back. Going back and forth skillfully across those three major events, the storytelling adds more connecting dots each time to the various characters and their roles in Shar's past and even his parents' pasts. This non-linearity creates excellent pace and tension, which Anwar never loses by revealing details only when absolutely necessary. Specifically with the Japanese occupation of Burma, Anwar's attention to detail shows the thoroughness of his research. Using the boat and the storm as recurring symbols is also a nice touch. That said, beyond that, the language throughout is not descriptive enough for the richness of the settings and events being depicted. Sometimes, there's the odd anachronism in dialogue with western phraseology that simply would not occur to someone from a village in East Bengal. In some instances, the mystery created with the aforementioned withholding of details comes across as contrived because conversations, scenes, or chapters end abruptly. This also results in an inconsistent payoff to the reader as those withheld details, when finally presented, do not always turn out to be sufficiently important or relevant. While it would be impossible to provide examples without ruining the suspense the author has so intentionally and carefully created, it's fair to say that the overall effect is one where the narrative skims in places it should dive. That skimming-versus-diving also means we do not get enough interiority with the characters. Whether it's Claire, the British doctor, trying to save a captured Japanese pilot, Ichiro, or Rahim, the Muslim bureaucrat, trying to decide whether to leave Calcutta for East Bengal, external pivotal events are shown as the main drivers. Such difficult life decisions usually involve plenty of internal conflict and trauma but these are rushed over or skipped to get to the next climactic moment. Two singular exceptions to the above are the relationships and interactions between Shar and Anna and between Rahim and the child Rakhi/Honufa. These are probably the best-written scenes in the book. For example, when Rahim is teaching Rakhi (as Honufa was known then) to read and write, her hunger and aptitude to learn shine through. When Shar is teaching Anna to write her name in Bangla, there's a palpable sense that it's his way of trying to give her a part of his past; of trying to create a stronger connection with her than, perhaps, he had with his parents. However, we don't know much at all about Shar's relationship with those parents because the time from when he was saved as a three-year-old in the storm to when he was a PhD student at an American university is mostly skipped over. That timeframe also covers East Bengal's most turbulent era: gaining independence as a separate country called Bangladesh and developing as a nation. So it's a curious authorial choice to focus on mostly the pre-1971 events as having significant impact on the life of a man whose coming of age happened after them. Unless Anwar aims to write a sequel by delving into that growing-up phase, this was a missed opportunity to create a more substantial story. Even if there is a sequel planned, leveraging the events from 1971 onwards would have undoubtedly allowed more complex layers to all the characters in this story. Nations are built on wishful versions of their origins: stories in which our forefathers were giants, of one kind or another. This is how we live in the world: romancing. Once the romance was about aristocratic connections and secret status, the fantasy of being part of an elite. Now the romance is about deprivation, dislocation, about the distance covered between there and here: between, let's say, where my great-grandmother was and where I am today. The facts have less traction, less influence on what we are and what we do, than the self-built fictions. In the end, The Storm is a first novel that, despite some inexplicable gaps and pat coincidences, must be applauded for its heart, urgency, and ambition.